You can use a Bosu Ball to perform many excellent core stability exercises! 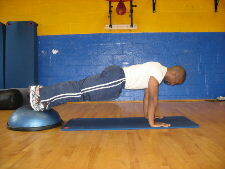 Core Stabilization is the first step in mastering core exercises and core training. Core Stabilization is best gained when there is little to no movement in the spine during the exercise, and the plank is a great core stabilization exercise. When you combine the plank with a Bosu Ball, you can create many different strengthening exercises that are great for developing core stability. I think the Bosu Ball is a great tool for ab exercises and core exercises. Because the Bosu Ball is unstable, your abdominals and core muscles will work harder, and you'll have improved balance, coordination, and core stability. Starting Position: Begin by placing your elbows on the floor and place your feet on top of a Bosu Ball. Keep your body in a straight line and engage your abs and core muscles. 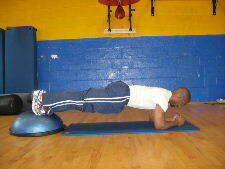 Form: This is an isometric core exercise, so simply hold your body in a straight line for 10-60 seconds. Personal Trainer Tips: Make sure that you keep a neutral position in your lower back and pelvis. Don't let your lower back sag and over arch, and don't lift your hips too high in the air. Starting Position: Begin by placing your hands on the floor and place your feet on top of a Bosu Ball. Keep your body in a straight line and engage your abs and core muscles. Personal Trainer Tips: Just like above, make sure that you keep a neutral position in your lower back and pelvis. Don't let your lower back sag and over arch, and don't lift your hips too high in the air. It can be a lot of fun to make up ways to challenge your abs and core. But you can get a lot of benefit from almost any type of core exercise. Core training is more than just making up crazy exercises. Read about How Core Exercises can Give You a Better Body or try these 14 Core Training Tips. 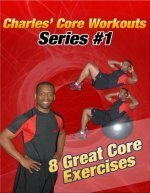 Lastly, visit the Picture Directory of Abdominal and Core Exercises to learn more core stability exercises or try one of the free core workouts.